One of the earliest events of the holiday season is Gingerbread Village, an event at Exploration Placethat allows all ages to get creative and make your own gingerbread house to take home. While you create, you&apos;ll enjoy holiday tunes from strolling carolers. The event runs 5:30-8:30 p.m. Friday, Nov. 13; 10 a.m.-6 p.m. Saturday, Nov. 14; 11 a.m.-5 p.m. Sunday, Nov. 15. Event fee includes admission to Exploration Place and a portion of the proceeds go to the Assistance League of Wichita. Assistance League and Exploration Place member admission is $5 per person; non-members cost $9.50 ages 12 and up, $8 seniors, $6 ages 3 to 11, ages 2 and under free. Don&apos;t worry if you miss this holiday event; Exploration Place has several more that start later in November and run through December. Children can meet Santa in the main lobby of the museum (no admission required) from 10 a.m.-noon on Saturday, Nov. 21 and 2-4 p.m. on Saturday, Dec. 5. Let It Snow! is a fun family show running from Saturday, Nov. 28 through Thursday, Dec. 31 in the Boeing Dome Theater and Planetarium. The show sets holiday images and scenes to favorite songs from Frank Sinatra to the Muppets. No general museum admission is needed to see a show in the dome. Dome prices apply: $5 ages 12 and up, $4 seniors, $3 ages 3-11, ages 2 and under free. Show times are posted at www.exploration.org. Also from Nov. 28 through Dec. 31, the popular Kansas in Miniature exhibit inside the museum will be decked out depicting a 1950s holiday, including a Christmas parade and nostalgic music. The exhibit is included in general museum admission. Gather in the open-air plaza next to the lake at Bradley Fair to watch the shopping center&apos;s 35-foot Christmas tree and miles of crystal lights come to life at 5:30 p.m. on Saturday, Nov. 21. Santa and his reindeer will be on hand to help light the tree and will be available for photos. Immediately following the tree lighting ceremony, guests can enjoy a horse-drawn carriage ride through Bradley Fair, a mix of local, regional and national stores and restaurants. The free carriage rides originate from the fountain located at the Bradley Fair Plaza and operate from 6-10 p.m. Nov. 21, 27, 28 and Dec. 4, 5, 11, 12, 18, 19. You may know how beautiful Botanica&apos;s gardens are in bloom, but have you seen the 17 acres of gardens at night with hundreds of thousands of lights and themed displays? 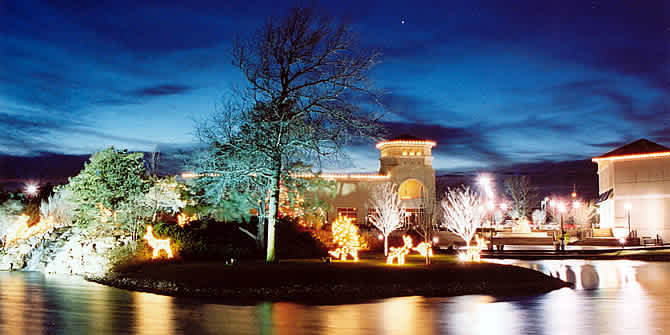 Illuminations at Botanica is Kansas&apos; largest holiday light display and a great event to get your family in the holiday mood. More than 5,000 LED luminaries will line garden pathways, more than 120 trees will be expertly lit and many structures will be twinkle with white lights. Imagine the warm glow of luminaries, the sound of electric trains traveling around pine trees, the reflections of trees on the pond, the magic of the flocked forest at Candy Cane Lane, the fragrance of chimineas, the warmth of hot cocoa and cider and the joy of live musical groups. Illuminations starts Nov. 27 and is held seven days a week, 5:30-8:30 p.m. through Dec. 31 (excluding Dec. 24 and 25). Tickets are $8 ($7 members) for adults and $6 for youth (3-12). Advance tickets can be purchased at all area QuikTrip locations or at Botanica. Members must purchase their tickets at Botanica in order to receive their discount. In 2010, credit card company American Express launched Small Business Saturday to help small businesses get more customers through their doors on the Saturday after Thanksgiving. The sixth annual Small Business Saturday happens this year on Saturday, Nov. 28, a perfect time to start your holiday shopping. Look for specials at dining, retail, entertainment and service establishments across Wichita. For example, the Explore Store at Exploration Place is offering a discount all weekend: 20 percent off purchases for members and 10 percent off for non-members, with no admission needed to shop in the store. The entire Prairie Rose Ranch in Benton will be decorated for Christmas, and they are presenting two Christmas shows in late November. Bucky Fowler&apos;s Family Country Christmas is one-night only, Saturday, Nov. 28. Christmas on the Prairie - a combination of Christmas music and comedy from the Prairie Rose Rangers - begins Friday, Nov. 27 and continues through December with evening shows Dec. 4, 5, 11, 18 and 19 and matinee shows Dec. 3, 13 and 20. Gates open well before the shows so guests can enjoy the ranch&apos;s decorations, horse-drawn wagon rides, Christmas movies and the Silver Screen Cowboy Museum. Tickets are $35 for adults, $10 for children 3-12, under 3 free and includes an all-you-can-eat chuckwagon supper. Attractions and venues across Wichita will present holiday-themed experiences throughout the month of December, from free events like A Night With Santa & Downtown Lighting Ceremony to events like Ballet Wichita&apos;s performance of The Nutcracker Ballet. Now is the time to start planning your calendar to take in as many as possible. Check www.visitwichita.com/holiday/ for the latest holiday happenings and watch for our next blog post, which will offer more ways to enjoy the holidays in Wichita.